This expansion can be played alone or with Happy Salmon Green to increase the maximum number of players from 6 to 12! 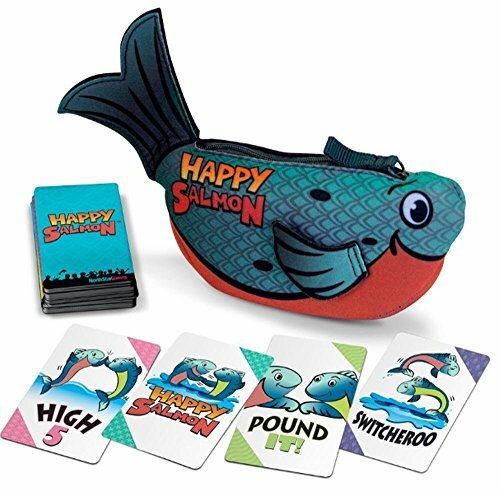 Happy salmon is the simple, fast-paced card game packed to the gills with high-flying, fin-flapping fun. Actions including the classic 'high 5', the unifying 'pound it', the frantic 'Switcheroo', and the delightful 'Happy salmon' will leave players doubled over in laughter. With so many mini-celebrations built into the play, its the happiest game ever! how to play: 1. Everyone calls out the action shown on their top card 2. When two players have a match, they celebrate by performing that action together, then discard their top card 3. The first player to match all of the cards in their deck wins! the Happy salmon blue expansion has arrived. It's the same fin-tastic game as before but with different colour cards. This expansion can be played alone or with Happy salmon green to increase the maximum number of players from 6 to 12! Happy salmon is suitable for 3 - 6 players aged 6 and up with a playing time of around 5 minutes. This game has the same concept as the green edition of Happy Salmon but you can combine the two decks for more players!